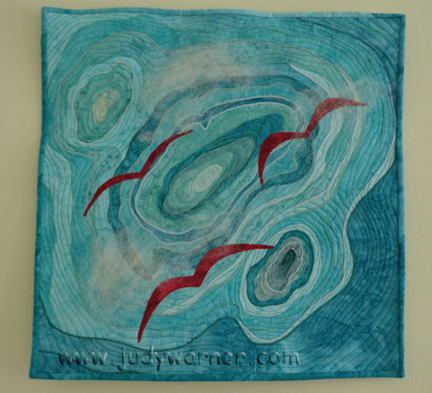 Explorations in Quilting and Life: Finally finished. I started this piece in early December. It was quilted before I left for Antartica but not complete. I knew I wanted to add the red bird-like images, but I also wanted something else. I finally decided upon a cloud-like addition as though one were looking down through a layer of clouds at birds and ocean. Looking through my stash and embellishments, I seized upon some alpaca roving that I had bought last summer. 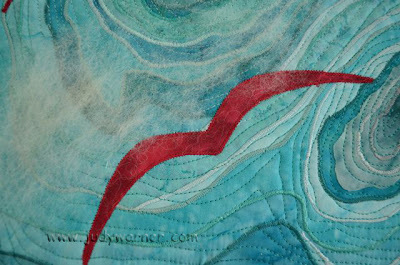 Felting it to the quilt created just the effect I was looking for. Judy, this is lovely and evocative....wish I could see it in person. Love the use of the alpaca fiber. Oh yes, Judy -- just perfect!